One of our goals for this year was to establish a central office that can be used as a learning center, classroom, library, visitor center, and housing for our volunteer directors. 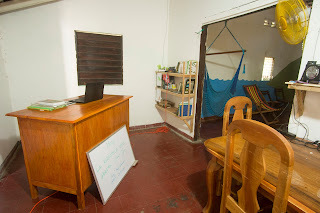 It's been a long journey and it's not done - but we've made enough progress over the past 5 months that it's time for a virtual tour of our Resource Center. 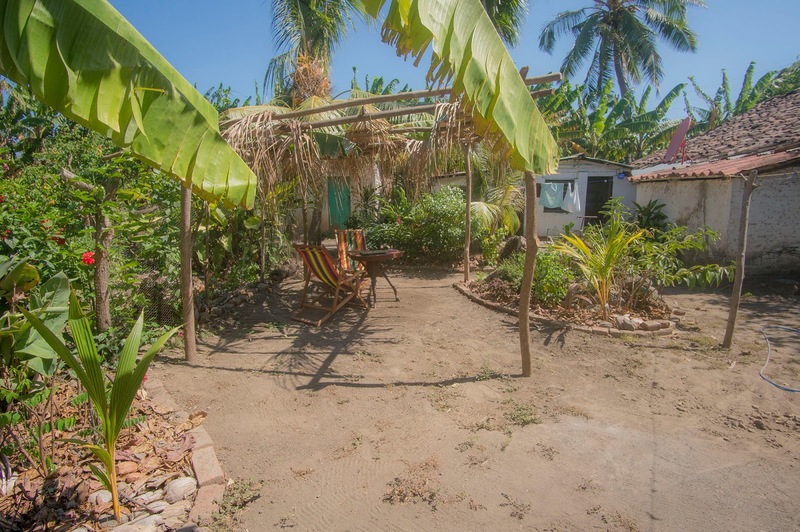 In December we located a rental house available that is just a block from Altagracia's central park and the main bus station in town. It is a large house with a gigantic plantain orchard out back, but it needed a lot of work. 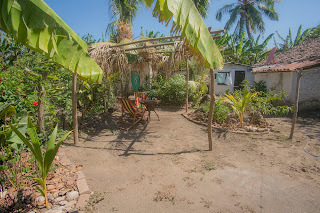 We spent the next 3 months cleaning up hurricane debris and planting a garden, fighting termites, fixing walls, repairing doors, furnishing, and scraping endless expanses of flaking paint. Sometimes neighbor kids would come and help us out. Look at that pile of sticks in the left-hand corner and guess what it might be for! After months of removing paint, our guide partners came over for a work party, and we got most of the main room painted in one day. 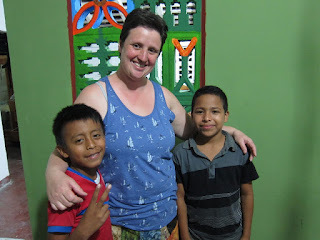 Kate and the kids pose in front of the newly decorated wall. 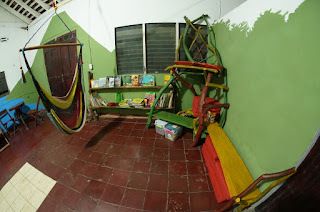 We decided to make our main-room library shelving and furniture out of scrap wood from the hurricane, which saved us money but required a huge amount of work. 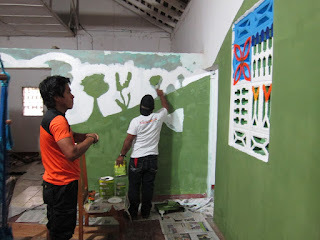 Some new friends from CONNACT global helped us for a day of sanding. And so our main room was transformed into a mini library. The mountains painted on both sides of the room are on the same sides as their corresponding volcanoes on the island: Concepcion (below) and Maderas (above). 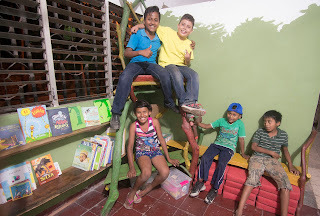 Below is the kid's section of the library with kids books in Spanish and English, crafts, games, and a high throne. Recognize the bench we were sanding before? 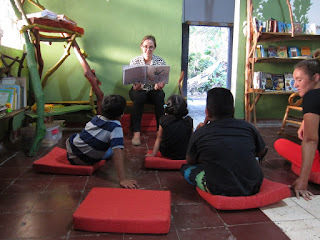 With the help of Amanda from Peace Corps, our library was available for our first storytime event with local kids. Although we have not officially opened with regular business hours, we have hosted test openings on a few random days. 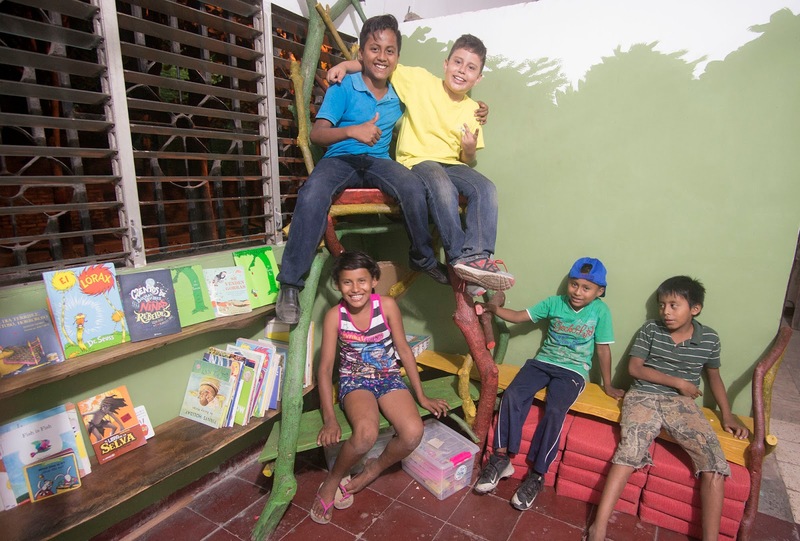 The neighbor kids quickly find out and enjoy reading books and doing crafts in the kids section. Yes, they do sit on the throne! After months of clearing debris out of the garden, we landscaped around a stubborn tree stump and added a large trellis. A line of young passion fruit vines line the left side of the trellis, and we hope that they will provide shade and lots of fruit within the next year or so. 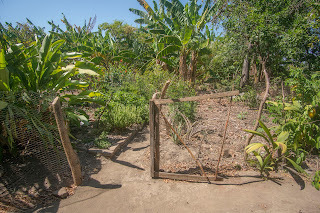 We also fenced in a smaller garden to keep neighborhood chickens away from the more delicate edible plants and seedlings. We have a bunch of herbs and greens planted, and there is still more room for some rows of veggies or other fun foods. 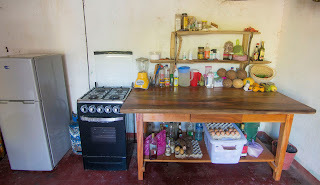 Back to inside: the kitchen was the first room we furnished. 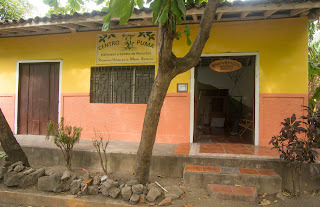 It may look humble, but it's quite a luxury by Ometepe standards. Our office space is still developing in the room between the kitchen and library, but we finally have a desk and shelving for the guide books and materials. On the other side of the office is the door to the bedroom. We added a deadbolt to the door for privacy and security, and we also raised the wall to the ceiling--before, you could climb over the wall into the bedroom (look at the first picture of the blog to see the same type of half wall). 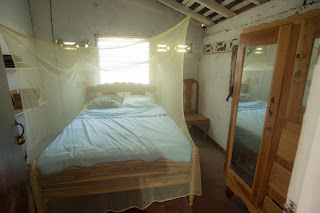 An open wall is fine if it's in a private house, but being part of a public office and library, the bedroom needed to be fully closed. The bedroom may not be large, but it has everything a bedroom needs. 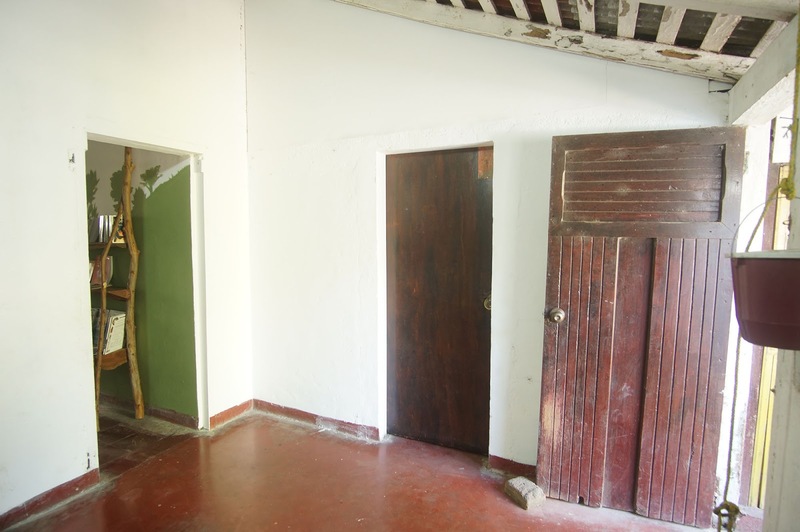 This enables us to include housing for our volunteer directors or project managers. We're still working on the last room. We've fixed the doors and added a giant cot that can be stowed in the new storage closet. It still definitely needs to be painted. 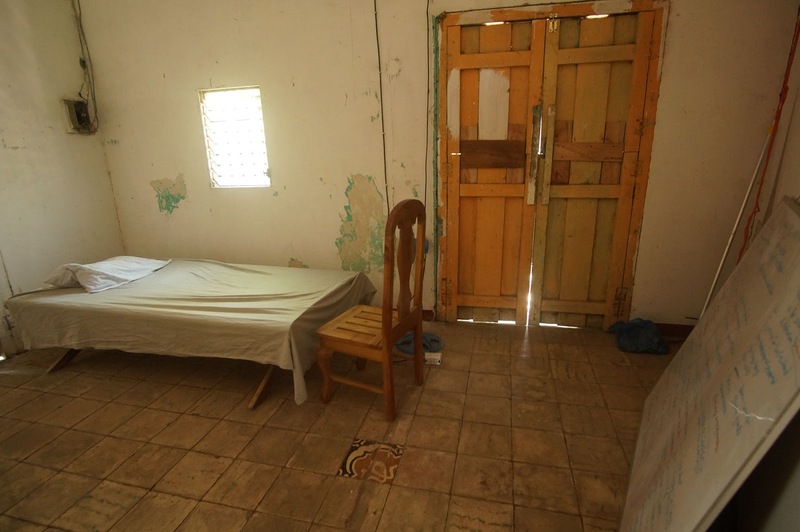 This extra room off to the side can be a reading room for the library, a classroom, and a temporary bedroom for guests. It's currently being used as a guest bedroom. 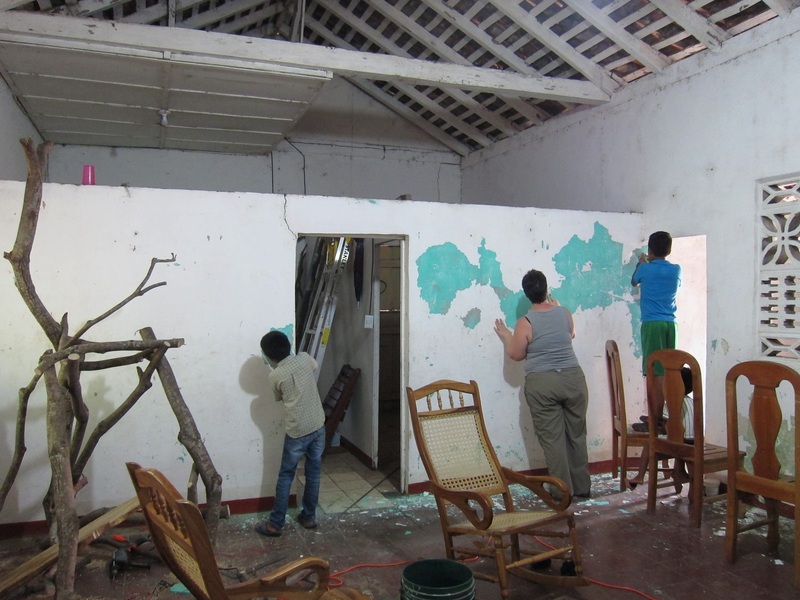 Renovating the Resource Center has taken a large amount of the time this season in Nicaragua. 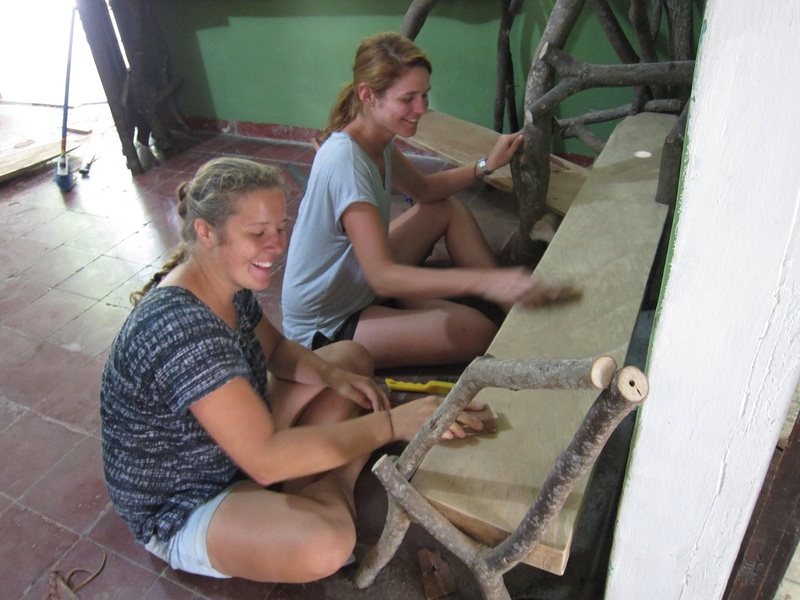 We hope that it will require a lot less work next year and will enable us to focus on and develop our other projects. We are very encouraged by the positive attention our library has earned with the neighbors, and we hope that it also appeals as much as a center for learning and administering our project. Now come visit us at Centro PUMA on Ometepe! We are looking for a volunteer for sometime between May and September 2018 - could it be you? 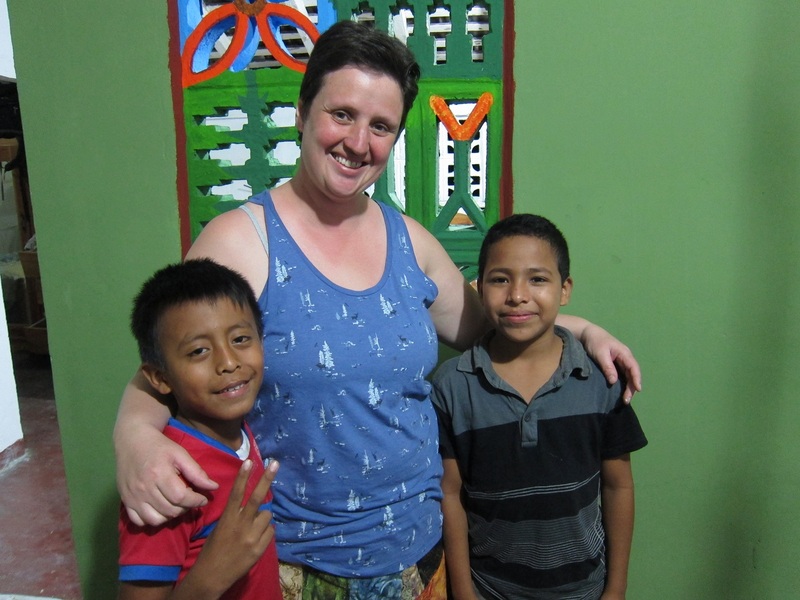 We need someone to coordinate our program in Altagracia for at least 10 weeks. 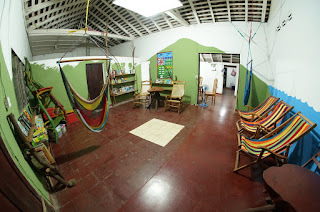 This position's main responsibilities are to staff and maintain the Resource Center, communicate and organize programs with our partner organizations on the island, and keep track of the finances. You will have your own secure room in the Center, with wifi, kitchen, and garden. You must speak English and Spanish, and have basic internet and office computer skills. Para el invierno de 2018 (Mayo hasta Septiembre, calendario flexible pero por favor trabaja a lo menos 2.5 meses), quiserimos a alguien para coordinar la programa en Altagracia. Necesita mantener y dotar de personal el Centro de Recursos, comunicar y organizar programas con organizaciones asociadas, y dirigir las finanzas. Vivirá en su propio cuarto seguro en el Centro, con wifi y una cocina y jardin. Necesita hablar español y ingles, y saber cómo utilizar las computadoras.